The Pakistan Navy celebrated the 68th Independence Day of Pakistan on 14 August 2015. The Independence Day ceremony was hosted by Rear Admiral Moazzam Ilyas, Commander of the Combined Task Force (CTF) 150. The ceremony along with the Pakistani Community was attended by representatives of the 30 nations of the Combined Maritime Forces (CMF) including Commander Combined Maritime Forces (CCMF) Vice Admiral John Miller and CCTF 151 Rear Admiral Hiroshi Ito. 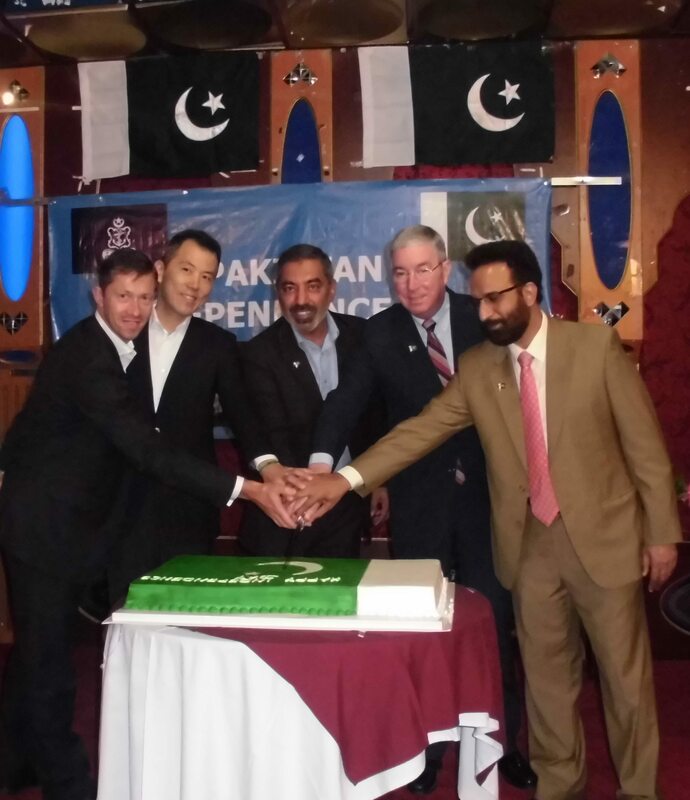 Pakistan 68th Independence Day celebration – cutting the cake. L-R – Commodore William Warrender, Rear Admiral Hiroshi Ito, Rear Admiral Moazzam Ilyas, Vice Admiral John Miller, and Mr Mohammed Ahad, Head of Chancery, Pakistan Embassy. In his opening address, Rear Admiral Moazzam Ilyas spoke of the importance of the day to Pakistan. He spoke of Pakistan’s wide geographic, cultural, social, political and economic spectrum. Adding that since its founding, Pakistan had changed a great deal, but its people carried forward the proud traditions of their ancestors. The ceremony concluded with a cake cutting ceremony. The Pakistan Navy took over the Command of CTF 150 on the 30th July for the eighth time. CTF 150 is one of three naval task forces operated by CMF, which is a multinational naval partnership of 30 nations. CTF 150’s mandate is to promote the conditions for security and stability in the maritime environment by countering terrorist acts and related illegal activities.